Get the best out of a silage maize crop by using the correct planting and management methods. To ensure that the maize crop intended for silage reaches optimal quality, it is crucial to harvest it at the best time. Maize silage is maize grain attached to a digestible grass and is a nutritive energy source. Both components – maize and grass – are important to silage quality. Maize grain provides about 65% of the energy found in maize silage. It’s therefore beneficial to achieve as much grain yield as possible from a silage maize crop because this will increase the energy-rich starch component in the silage. Keep in mind that the grass component of silage maize is high in fibre, which influences the maize silage energy density and animals dry matter (DM) intake. Maize silage is a concentrated feed containing appreciable levels of starch in a highly digestible form, together with effective roughage and protein. This allows a farmer to cut back on more expensive additional feed inputs. 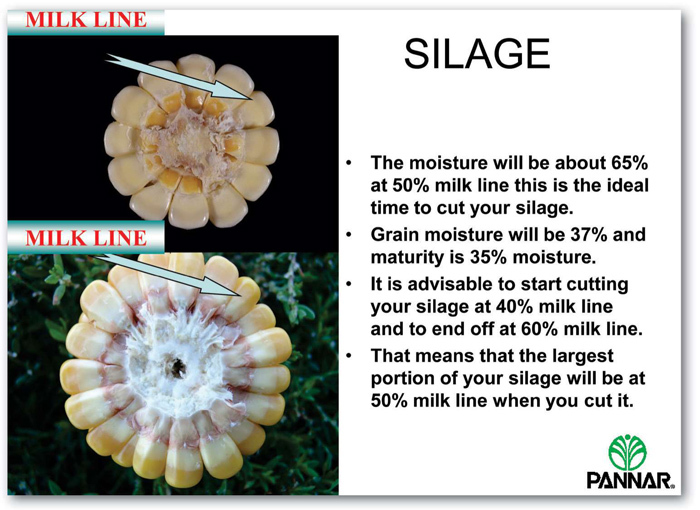 There are three factors that affect final silage quality. The first is the environment, which is largely out of the farmer’s control. It includes water, sunlight, heat, soil properties, pests and diseases. The second is the silage maize hybrid selected for production. Choosing the correct hybrid best suited to local conditions is crucial. The third is management and it has the greatest influence on silage maize crop yield and quality. Management focuses on planting and cultivation practices, crop maturity at harvest and crop processing and ensiling, among others. You need to ensure that the hybrid you’re planting has a track record of good yield performance within your local environment. To ensure that the maize crop intended for silage reaches optimal quality, it is crucial to harvest it at the best time. The primary goal should be to maximise starch content. In the plant’s initial growth stage, development is centred on producing the stem and leaves. After this, tassels begin to appear, and grain-fill of the cobs takes place over about eight weeks. This is a critical period, because about 50% of the crop’s final DM accumulates then. The bulk of this DM accumulation is grain starch. Moreover, during this period the starch content of the maize grain changes as the plant matures. The later the crop can be harvested for silage, the higher its starch content is likely to be. This adds both quality in the form of starch and quantity in the form of DM to the maize silage. The ‘milk line’ – the colour difference between the soft and hard starch content of the maize kernels that can be seen on a cob snapped in two, it can be used to determine starch content and hence when the crop is ready for harvesting. The maize is ready for ensiling when the milk line has moved halfway down the kernel. 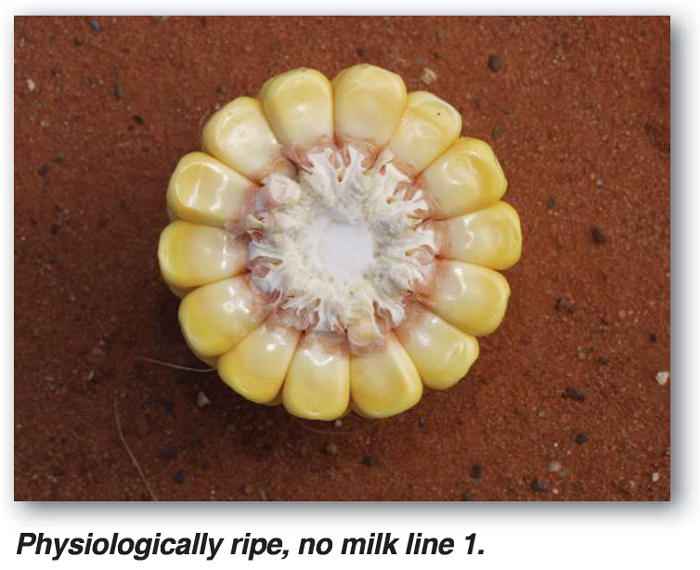 For maximum starch, the crop should be ensiled only once the milk line is two-thirds of the way to the tips of the kernels on most cobs sampled from the standing crop. This coincides with about 35% DM content of the crop. Ensiling a silage maize crop at a higher DM content requires care and good management. Silage should be packed firmly and compacted in pits to remove as much air as possible to reduce the oxygen content, thus reducing the risk of spoilage before the pit is covered. It is important to ensure that the kernel cracker in the harvester breaks the kernels properly as ‘uncracked’ whole maize kernels simply pass through the animal’s digestive system. This is a waste of potentially top-quality maize silage. During fermentation and post-fermentation storage, the digestibility of the starch in the silage improves, influencing the quality of the final product. Although the silage is ready for utilisation after about four weeks, fermentation in the silage pit should continue for at least six months for maximum digestibility before the silage is utilised. Prevent water from contacting the stored forage. Feed the silage out carefully to reduce further loss. Try to expose the silage as little as possible to air, as oxygen is detrimental to the silage quality. Discard silage that deteriorates. Paying attention to detail can significantly improve the final quality and quantity of the silage that you cut every year.